The work of Andrzej Jackowski is largely autobiographical, based on his early childhood memories, recollections of a family history in Poland, and the feelings of alienation and enclosure that these experiences roused. Born in 1947 to Polish parents in North Wales, his first eleven years were spent in a post-war refugee camp. He lives and works in Brighton, England. John M. Anderson teaches creative writing and literature at Boston College. He has new poems in Crazyhorse, Beloit Poetry Journal, and Tuesday: An Art Project. His chapbook, Dictionary Quilt, was published by Pudding House in 2007. Last year, his manuscript Blackwater Driveby was a finalist for the May Swenson Prize. He is finishing a book-​​length manuscript called Alamos: A Chain Reaction, a ghost story about J. Robert Oppenheimer, father of the atomic bomb. James Gleason Bishop has worked as a reporter, toymaker, Air Force Officer, and farmhand. His poetry and nonfiction are forthcoming or have appeared in Connecticut Review, North American Review, Smithsonian, Yankee, the Xavier Review, Free Lunch, and Christianity and Literature. His work was nominated for a Pushcart Prize. He teaches English at the Air Force Academy. Shahar Bram is the author of Charles Olson and Alfred North Whitehead: An Essay on Poetry, Bucknell University Press, 2004. His new book, The Ambassadors of Death: The Sister Arts, Western Canon and the Silent Lines of a Hebrew Survivor, Sussex Academic Press, is forthcoming in January 2011. His essays, articles and translation have been published in such literary journals as Word & Image, Partial Answers, and Connotations. Susanna Brougham’s poetry has appeared in Seneca Review and Southern Humanities Review. She is the recipient of an emerging artist grant from the St. Botolph Club Foundation. She works as a book editor. Born and raised in Albania, Ani Gjika is currently a teaching fellow at Boston University, pursuing an MFA in poetry. She received a 2010 Robert Pinsky Global Fellowship and a 2010 Robert Fitzgerald Translation Prize. Her poetry has appeared or is forthcoming in Seneca Review, Stirring: A Literary Collection, MiPOesias, Perendim i Mallur: Anthology of Albanian Poets in America, and Pelegrin: Albanian Literature Magazine. Lee Johnson is a Poe/​Faulkner Fellow at the University of Virginia, where he works as a writing instructor and fiction editor for Meridian. He also works part-​​time hauling trash. His fiction has appeared in the 2010 Mississippi Review Prize Issue. Amy Kitchell-​​Leighty received an MFA from Bennington College in ‘09. Her poetry has appeared in Bellevue Literary Review, the Coachella Review, White Pelican Review, Rockhurst Review and many others. She lives in the Midwest and teaches at a men’s medium security prison. Benjamin Landry is author of An Ocean Away and winner of the 2009 Columbia Poetry Contest. His poems have appeared in Sou’wester, the Grove Review and Unsaid. He and his wife have lived and taught in such far-​​flung places as Bogotá and Beijing; they currently work for the University of Michigan and reside in Ann Arbor. Susan Magee is an assistant professor of English and Communications at Chestnut Hill College in Philadelphia. Her short fiction has appeared in the North American Review and the Florida Review. She is a graduate of the Bennington Writing Seminars. Four Way Books will publish Rose McLarney’s book, The Always Broken Plates of Mountains, in 2012. McLarney earned her MFA from Warren Wilson’s MFA Program for Writers and is the Joan Beebe Teaching Fellow at the college. She grew up in rural western North Carolina, where she continues to live and raise a variety of livestock. Sally Molini is a co-​​editor for Cerise Press, an international online journal based in the US and France. Her work has appeared or is forthcoming in Denver Quarterly, Diagram, Beloit Poetry Journal, Barrow Street, Rattle, and other journals. She lives in Nebraska. Timothy Mullaney teaches writing at Washington University in St. Louis. He is a former Van Lier Fellow at the Asian American Writers’ Workshop in New York City. His fiction has appeared in the journal Washington Square. James Norcliffe is a New Zealand writer. He has published six collections of poetry, most recently Rat Tickling, Along Blueskin Road, and Villon in Millerton; and several novels for young people, most recently the The Assassin of Gleam and The Loblolly Boy (just released by Egmont in the USA as The Boy Who Could Fly). Recent work in the US has appeared in the Iowa Review, the Cincinnatti Review, and Gargoyle. Molly Patterson lives in Columbus, Ohio, where she is a candidate for the MFA in Creative Writing at The Ohio State University. Her short stories have appeared in the Arkansas Review and Zone 3. She is currently at work on a novel. Originally from Texas, Eleanor Paynter lived in Atlanta and Rome before moving to New York, where she writes, teaches, and translates. Her poems have recently appeared or are forthcoming in Washington Square Review, Cooweescoowee, Pebble Lake Review, and Verse Daily. Rosemary A. Peters lives and writes in Louisiana, where she is on the faculty of Louisiana State University. She has recently completed a book on 19th-​​century French novels, and is now looking forward to having more time to write poetry. Laura Read teaches composition, literature, and creative writing courses at Spokane Falls Community College. She has published poems in a variety of journals, most recently in the Spoon River Poetry Review, New Ohio Review, Pank, and the Floating Bridge Review. Her chapbook, The Chewbacca on Hollywood Boulevard Reminds Me of You, is this year’s winner of the Floating Bridge Chapbook Prize and is forthcoming from FB Press this fall. She lives in Spokane, Washington with her husband, Brad, and their two sons, Benjamin and Matthew. Joseph Riippi is author of the novel Do Something! Do Something! Do Something! (Ampersand Books, 2009) and the forthcoming novella, The Orange Suitcase (Ampersand Books, 2011). His writing appears in The Brooklyn Rail, elimae, Ep;phany, Pank, Everyday Genius, Metazen, and others. He lives in New York City, where he is finishing his MFA. Aidan Rooney is a native of Monaghan, Ireland, who resides in Hingham, Massachusetts. He has taught French at Thayer Academy since 1988. His poems are collected in Day Release (2000) and Tightrope (2007), both published by The Gallery Press. A new collection, Histories, is forthcoming. Cassie Schmitz is from Tallahassee, FL. Her poems have appeared or are forthcoming in Mid-​​American Review, Cimarron Review, Diagram, storySouth, and elsewhere. She received her MFA from Boston University and currently works for a biomaterials engineering lab. Jason Tandon is the author of two collections of poetry, Give over the Heckler and Everyone Gets Hurt (Black Lawrence, 2009), winner of the 2006 St. Lawrence Book Award, and Wee Hour Martyrdom (sunnyoutside, 2008). His poetry and reviews have recently appeared in the Boston Review, Bellingham Review, Pleiades, Verse Daily, and on The Writer’s Almanac. He teaches in the writing program at Boston University. Born in Sorel, Québec, in 1957, Élise Turcotte has published ten collections of poetry for which she has received numerous prizes. Her most recent books are Ce qu’elle voit (Noroît, 2010), Piano mélancolique (Noroît, 2005) and Sombre ménagerie (Noroît, 2002). She has also published short stories and three novels as well as a collection of prose. Her books have been translated into English, Catalan, and Spanish. The poem published in this volume of Salamander is from Sombre ménagerie. Andrea Moorhead (translator) was born in Buffalo, New York, in 1947. Editor of Osiris and translator of contemporary Francophone poetry, Moorhead publishes in French and in English. Translations include Night Watch (Red Dragonfly Press 2009; Abderrahmane Djelfaoui) and Stone Dream (Guernica Editions 2010; Madeleine Gagnon). Emily Van Kley lives, writes, and misses the snow in Olympia, WA, with her partner, dear friends, some kale-​​obsessed chickens, and a belligerent cockapoo named Fancypants. In recent years she has published poems in Cutthroat and Oberon, been a finalist for Narrative Magazine’s Below 30 Contest and won the Florida Review Editor’s prize for poetry. Julie Marie Wade is the author of two collections of lyric nonfiction, Wishbone: A Memoir in Fractures (Colgate University Press, 2010) and In Lieu of Flowers (Sarabande Books, 2011), as well as a poetry chapbook, Without (Finishing Line Press, 2010). “Eucharist” is from a new collection-​​in-​​progress titled Catechism: A Love Story. Bruce Willard’s first collection of poems is Suspect of Certainties. He has poems forthcoming in African American Review, Agni, Harvard Review and 5 A.M. He divides his time between Maine and California. Franz Wright published his last full-​​length collection of poems, Wheeling Motel, with Knopf in 2009. 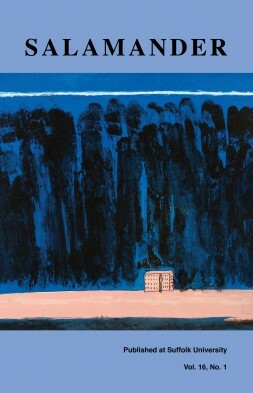 His next book, Kindertotenwald, a selection of sixty-​​five prose pieces, will appear in fall of 2011 (Knopf). In between, he has published two chapbooks with Marick Press, edited by Mariela Griffor, including 7Prose and Entries of the Cell, which will appear this winter. His Walking to Martha’s Vineyard received the Pulitzer Prize in Poetry in 2004.